Hotel and Spa in Scotland. It was this work that established her fascination with human anatomy and her desire to improve an individual’s life, leading her to enrol at university to study osteopathy. 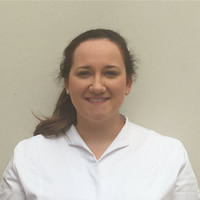 In 2017 she graduated from Leeds Beckett University with a Master’s degree in osteopathy. musculoskeletal care and osteopathic treatment. Charlotte has also begun to develop her skills in cranial osteopathy. Cranial osteopathy is a subtle, more gentle approach to treatment that has a very powerful effect on the tensions and stresses held deep within the body. It is ideal for treating very acute pain as well as headaches. She has also had great success in relieving the pains and stiffness associated with ‘wear &amp; tear’ and arthritis by treating the associated muscles, tendons and ligaments as well as the affected joint. She wishes to empower her patients to improve their own health and quality of life through osteopathic treatment, referral to other practitioners when applicable, home advice and exercise.